The Liberal government is proposing changes to the Canada Labour Code, but they don’t go far enough. The changes would apply to workers in federal jurisdictions. CUPE supports updating the Code, but argues that the proposed changes fail to provide adequate protections and reasonable access to leaves for workers. This is the message that CUPE delivered this week to the House of Commons’ standing committee on Finance. 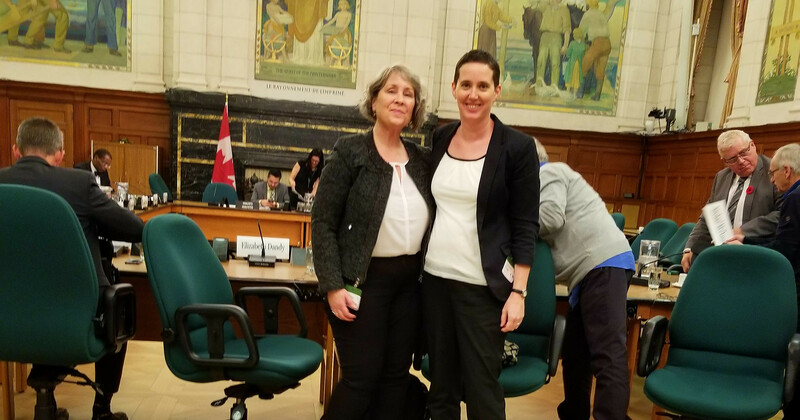 Elizabeth Dandy, CUPE’s Director of Equality, and Chandra Pasma, CUPE Researcher, presented the union’s submission on Bill C-63, the proposed Budget Implementation Act. CUPE welcomed the opportunity to present its perspective, and urged the government to go further. The federal government should be setting a high standard for the province to emulate. Unfortunately, in many areas, the Canada Labour Code lags behind the best provincial standards. The changes being proposed in Bill C-63 do not bring the new federal standards up to the level of the strongest provincial standards. Advance notice of schedules. The federal government is proposing 24-hour notice of schedules, but this is nowhere near enough to allow workers to plan and live their lives. CUPE suggests at least one-week’s notice of schedules. The right of workers to refuse overtime. The government’s proposals currently provide employers an exemption that could be used to pressure workers to accept overtime. CUPE recommends that the government delete this exemption. The right to request flexible work arrangements. Workers already have the right to request flexibility in their work arrangements. The government is proposing only to require employers to provide a written response to workers’ requests. The proposal does nothing to address precarious, short-term, part-time, casual work and insufficient minimum wages. CUPE urges the federal government to do much more to address the issue of precariousness in our economy. Adequate leave for victims of family violence. The government’s proposals would grant victims of domestic violence ten days of unpaid leave and they would grant employers the right to demand documentation about the worker’s situation. These are not standards that will help women and children trying to escape abuse. CUPE suggests workers should have up to ten days of paid leave, and be able to take partial days, among other improvements. Leave for traditional Aboriginal practices. The proposals include a new leave of five days for a limited number of traditional practices if a worker can provide documentation to prove their Aboriginal status. CUPE appreciates the intent but is concerned that the range of acceptable practices is too limited under the proposal. Further, it should not be left to employers to determine Aboriginal status. Any proposed leaves for Indigenous workers must properly recognize and respect the full rights of Indigenous peoples. CUPE urges the government to consult more widely with Indigenous governments and organizations on this issue. You can read our full submission on Bill C-63 here. It includes more detail about CUPE’s perspectives on the proposed changes to the labour code, along with our full suite of recommendations.